1 (quote) Well, you pay for what you get, I suppose. 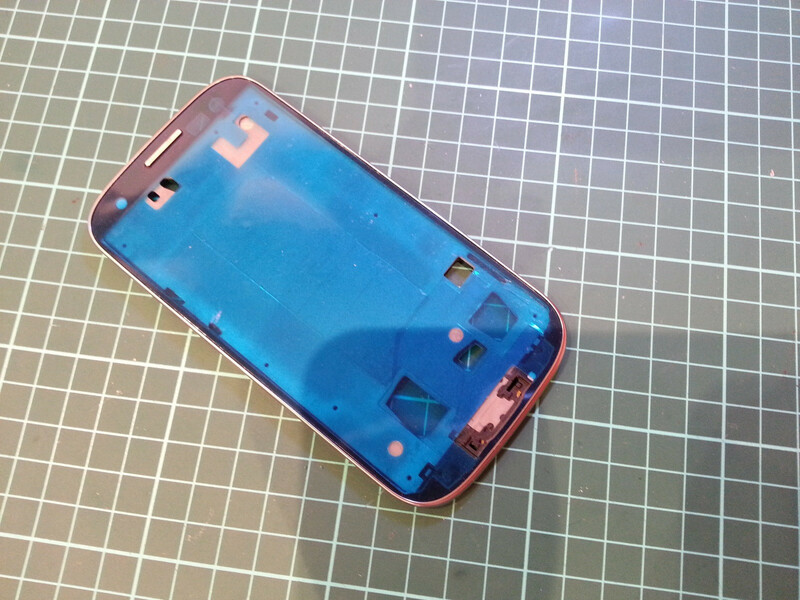 [With pics] How to replace only the glass (not the whole "LCD") on a Galaxy S3! 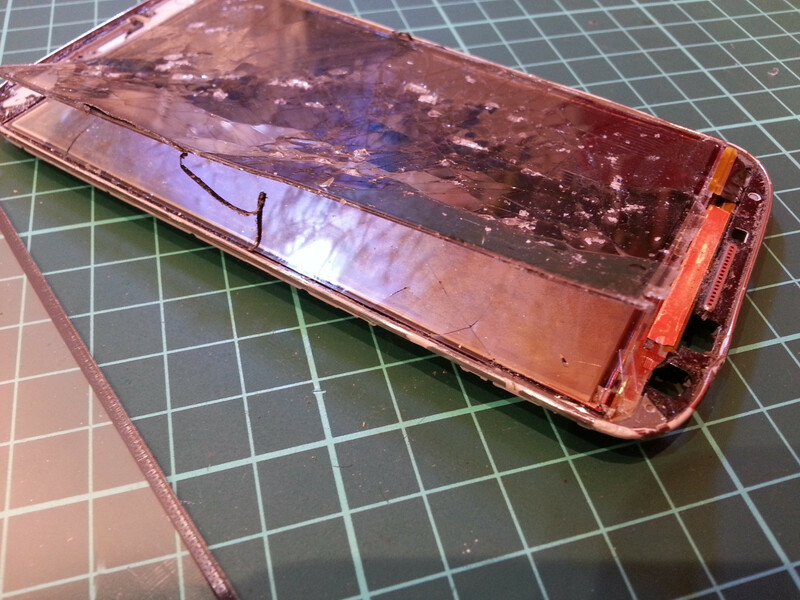 Although it is entirely possible, the chance of failure if done by people with absolutely no experience with mobile phone repairs is very high. Maybe it seemed too easy. That's because it was too easy. Chances are those screens have already been replaced before by a third party who has access to professional equipment and skills. Possibly the screen has been broken more than once? Even if you do successfully replace the glass only, it is guaranteed that you will get scratches, dust, fingerprints and adhesive marks on the Super AMOLED panel, no matter how much you clean it. That's because you won't be doing the repair with gloves on in a clean room free of dust. And that's not all - after a few weeks or months of use, dust will somehow find a way to get in between the glass and SAMOLED+ panel because you didn't use machine-cut adhesive that adheres your glass perfectly, leaving no gap for dust to get in. 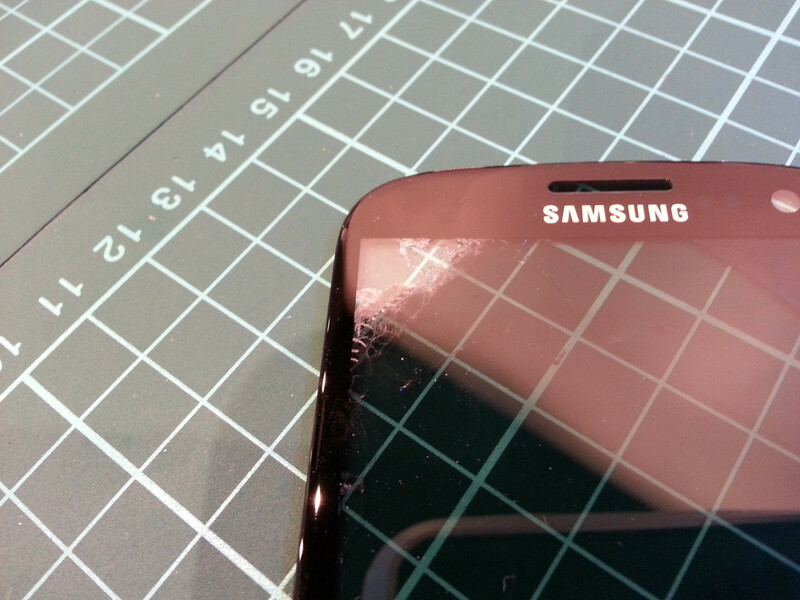 Your screen's touch sensitivity will drop as well, since it's not making adequate contact with the digitizer. And on top of that, the visibility will also drop. Those problems don't show up on camera, and can easily be masked/hidden from the camera, too. If this is only your first time breaking the screen on your S3, those tutorials won't work for you because your screen was manufactured as one whole piece by Samsung. The glass on your phone won't fall out by itself because the whole glass is optically laminated to the SAMOLED+ panel using a Liquid Optically Clear Adhesive, or LOCA for short. This kind of adhesive is a little bit sensitive to heat, but can't be completely removed because it is cured using UV light, not heat. But the biggest disadvantage is the increased cost of repair. That's what you have to pay for all those aforementioned advantages. It also certainly doesn't help that the screens are getting thinner and thinner every year. The likelihood of breaking the screen increases every year too. Here's a little photo album that I'd like to share with everyone documenting my experiences trying to remove the glass from full original Samsung screens that haven't been replaced or tampered with before. Click to enlarge. 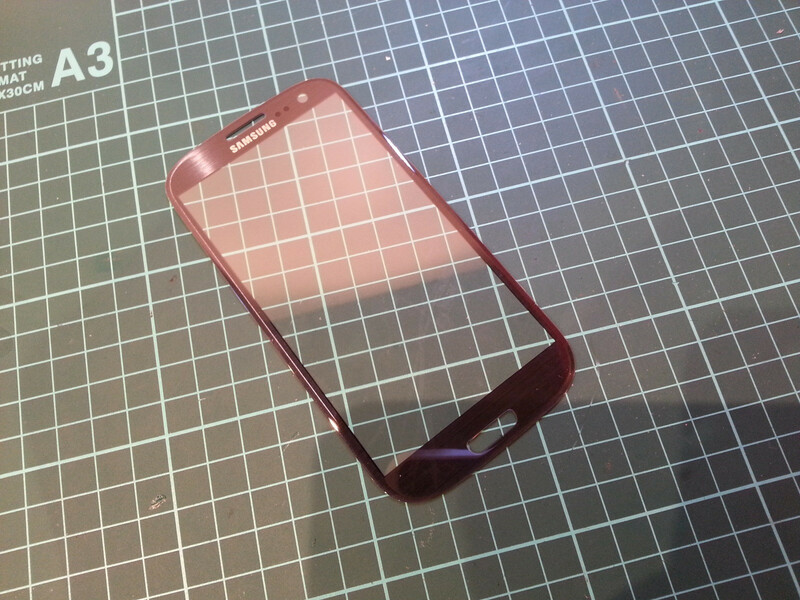 This is a picture of the Black Samsung Galaxy S3 GT-i9300. 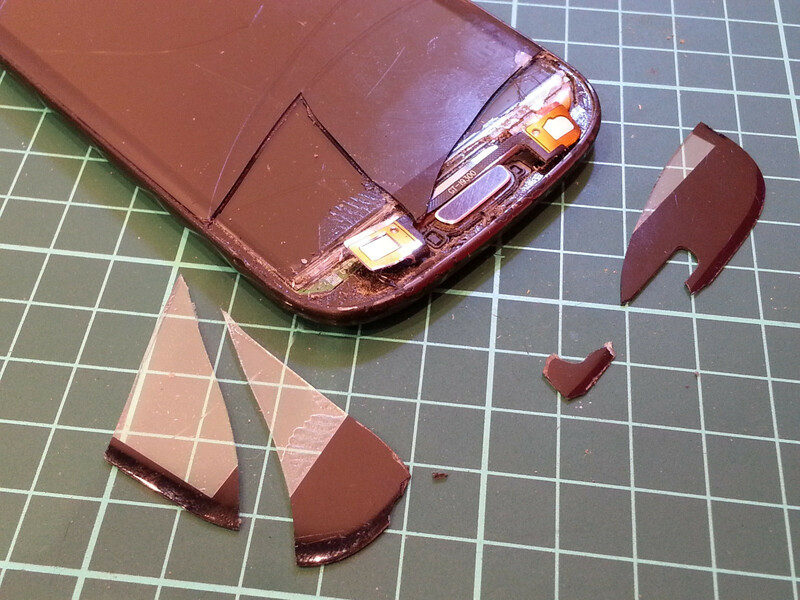 Only the glass was broken, so I attempted to separate it from the AMOLED panel using a heat gun and some plastic pry tools. So far so good, until the AMOLED panel broke because it is optically bonded to the glass and also stuck to the frame underneath it. You can still see some LOCA on the AMOLED panel and glass. 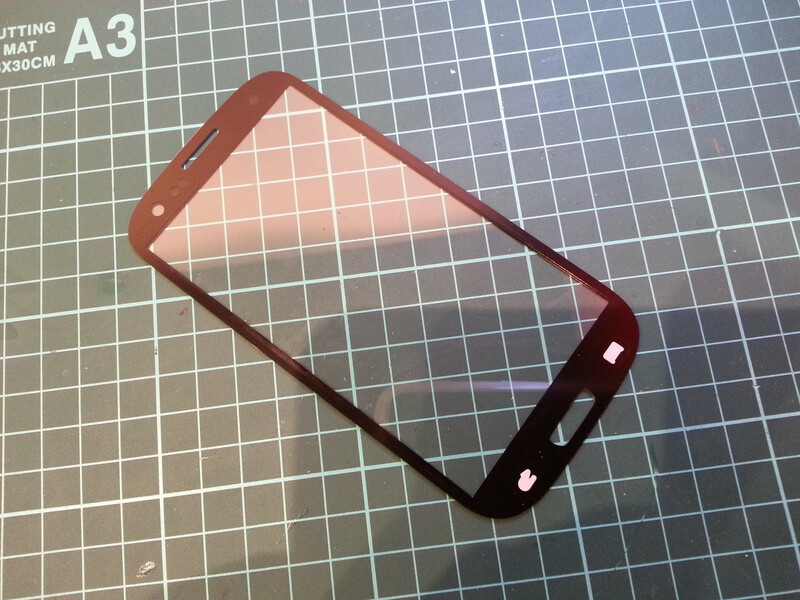 Second is the Galaxy S4 GT-i9505. It was broken on the top half, so I started removing the glass from the bottom. Again, the LOCA wasn't very cooperative, staying quite solid throughout the removal. 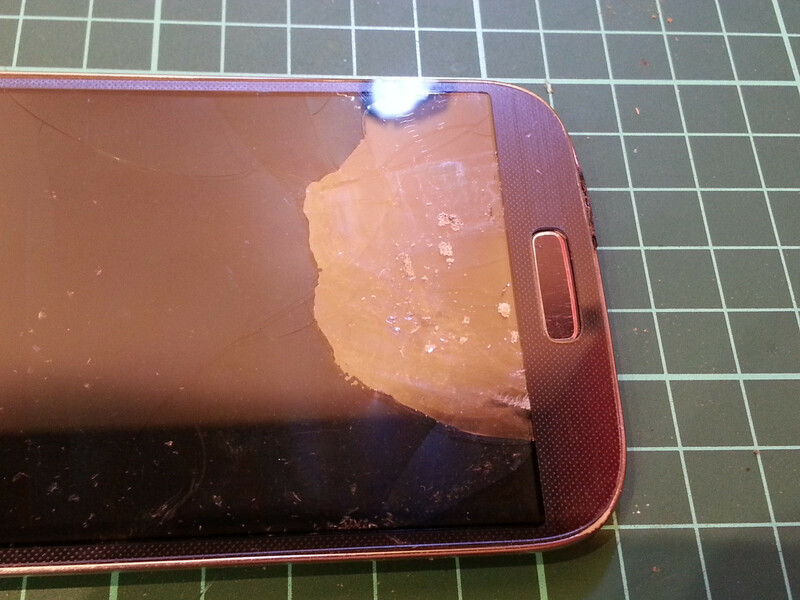 Eventually, the S4's AMOLED panel broke too. It didn't look like the broken original Samsung screens wanted to be separated, so I moved on to fully intact screens. It was a pain trying to separate this one. 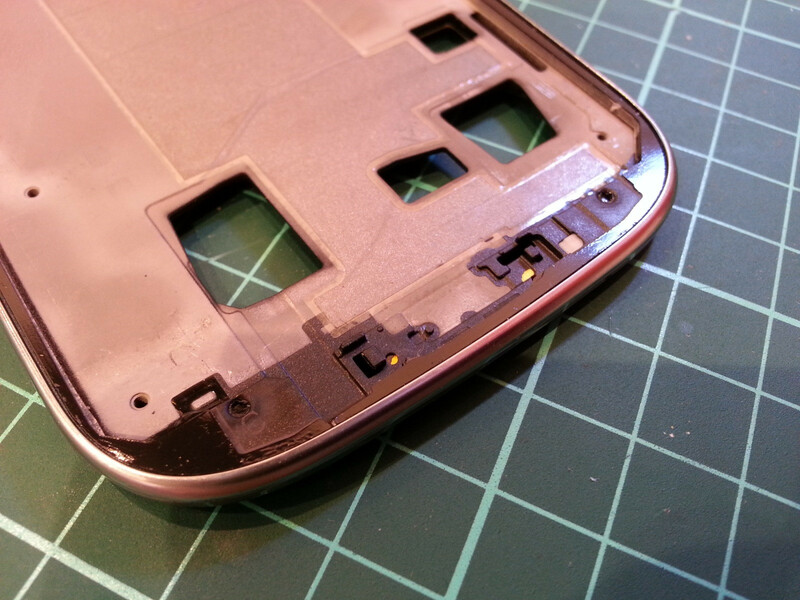 The adhesive was very difficult to remove, and the screen's touch digitizer circuit and polarizer started to separate from the AMOLED panel. 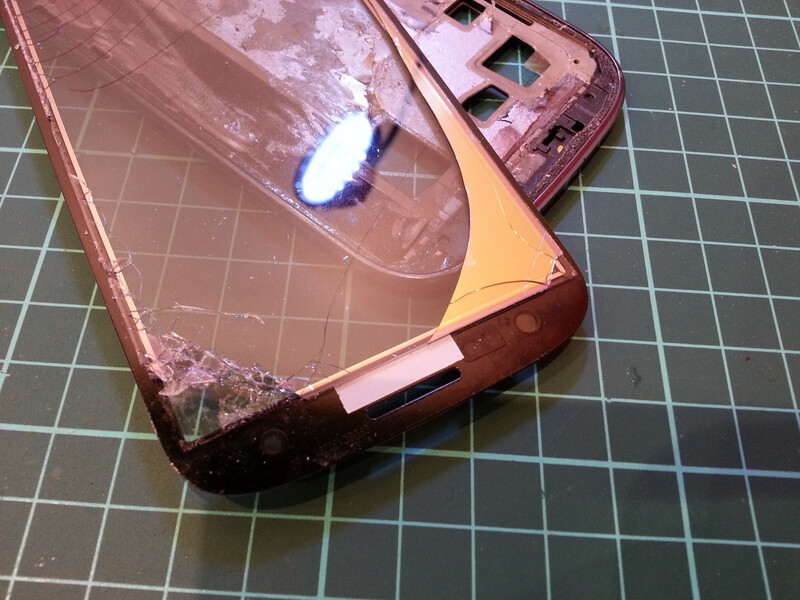 As you can see, the glass came off intact, but the AMOLED underneath was completely destroyed. 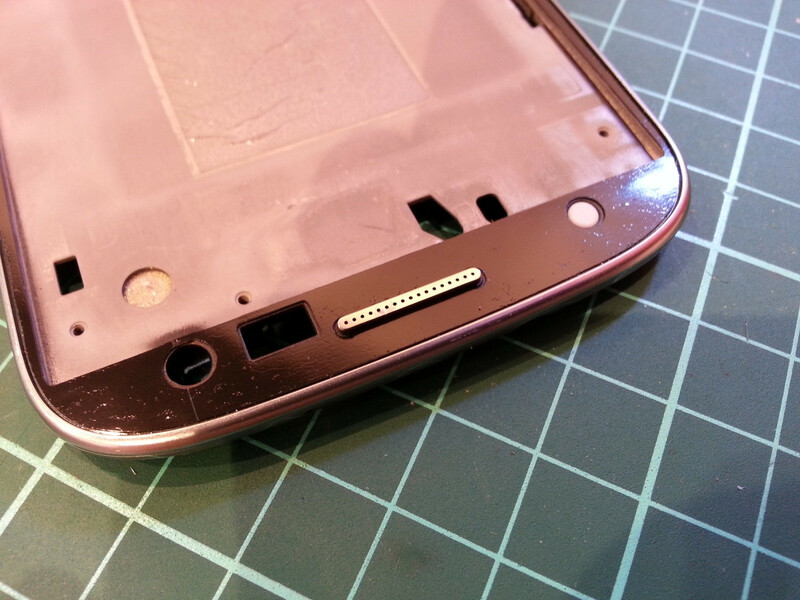 It doesn't look like the digitizer circuit/polarizer is bonded to the AMOLED. 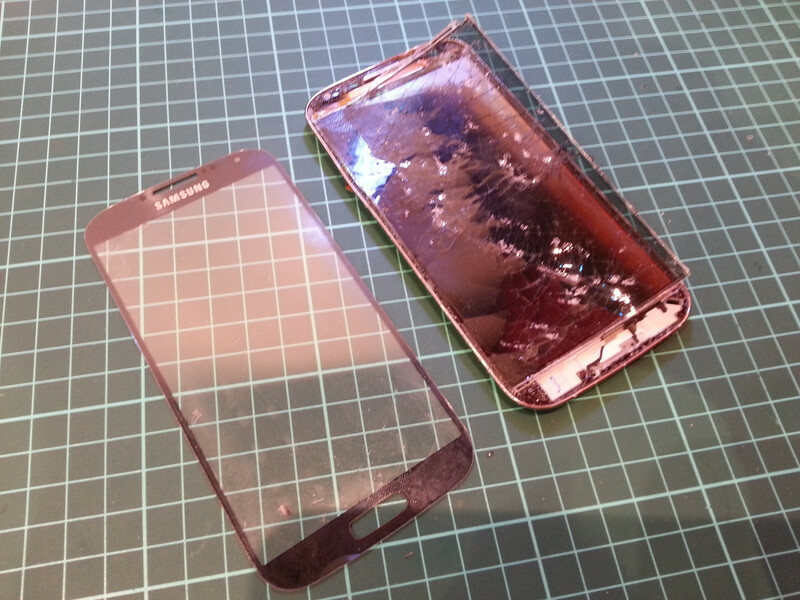 It just gets sandwiched on top, so it is very easy to unintentionally separate it from the AMOLED instead of leaving it on and only removing the glass, especially if the glass is smashed into a thousand fragments. The glass was in one piece though, and you can see how that turned out. 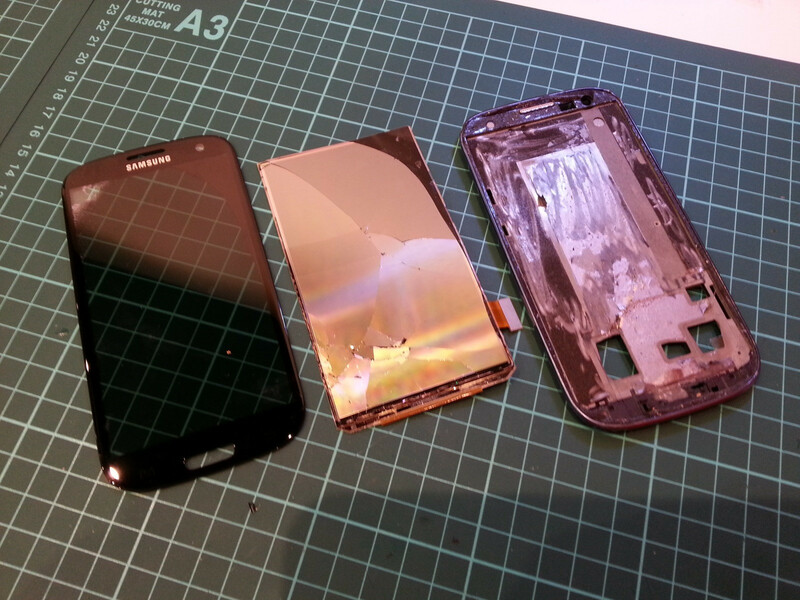 Some of the AMOLED panel itself came off and was still stuck to the glass! 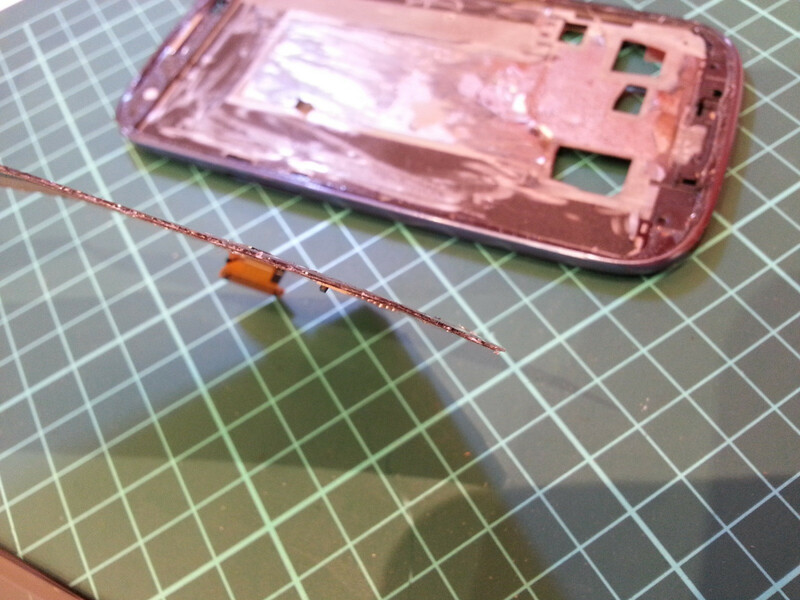 You can see how thin and fragile the AMOLED panel is on the Samsung Galaxy S series phones. 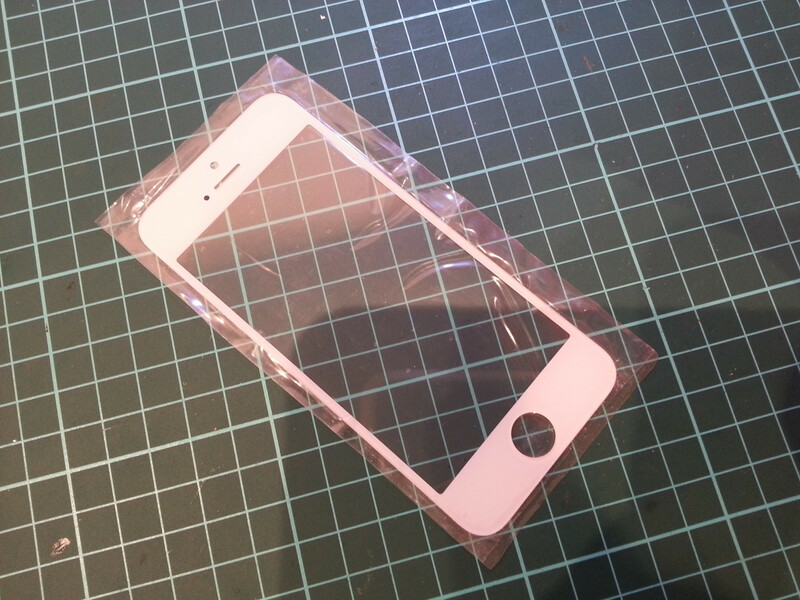 Sure, it's thin, but is it worth it? The panel has to be supported by the frame and the glass to stay intact. The panel on the S4 has a slimmed down bezel and was made thinner again, so it's a lot easier to break the AMOLED on the S4 than it is on the S3. Sure, these glass panels can be had for about $10, but is it worth all the effort to end up with a screen full of dust and fingerprints, has a warped frame and will eventually come loose and fall off, or simply just to destroy the AMOLED panel then spending extra money on a whole display assembly? 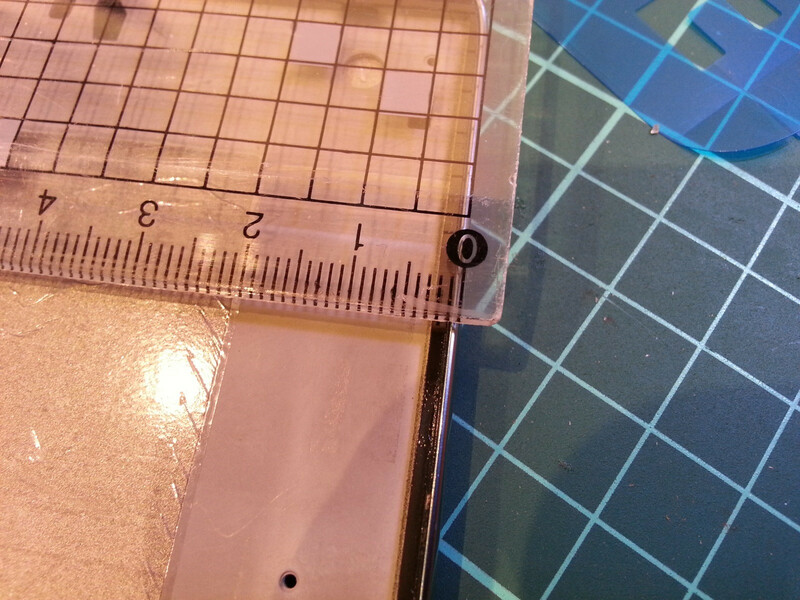 Reapplying the glass leaving no gaps for dust to get in requires adhesive that is machine-cut perfectly for your frame. Sorry for such a long post. I'm spending my time, efforts and money so you don't have to. I will occasionally add to this thread when I get more screens to experiment with. Most of the time its a better idea to just buy an entire replacement. 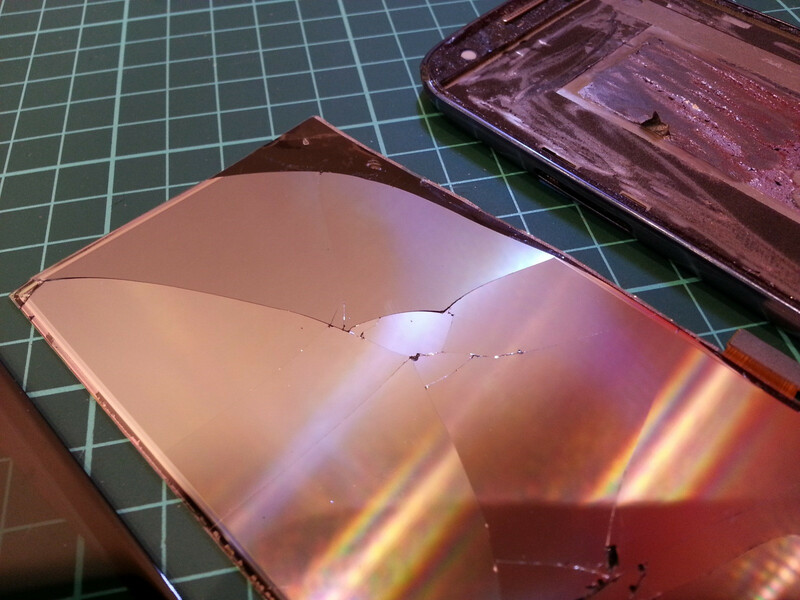 I've replaced glass on nexus 7's and Galaxy Note2's a few times. it's not fun to replace glass or lamination, and it's just a whole lot easier to purchase a "parts" phone with a working display from ebay and swap out boards. Glass is one of my least favorite things to play with. I will never, ever separate the glass and the screen. I know that it will break for sure. When I replace phone glass, I replace the entire front screen assembly which includes the glass, screen, and any frame to attach it into the phone. 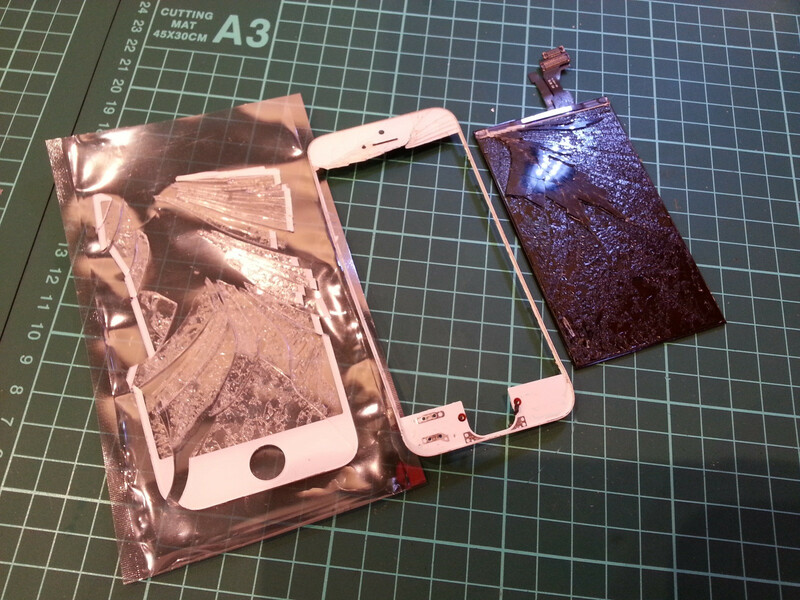 Even if it's just the glass that's broken and the LCD still works, still replace the entire front assembly. I think the point is that unless you have all this stuff you shouldn't be even attempting to replace the glass. just save your money and buy the digitizer with the AMOLED attached..
but what will you do with the old screen with the broken front glass ? I have replaced many screens, and in my experience, you're always best buying everything as readily assembled as possible. Out of 5 attempts at separating the S3 Glass from the AMOLED panel, I have managed it twice without breaking the AMOLED, and that involves also keeping the digitser intact as well, which is between the outer glass and the AMOLED. Back when I was doing this, you were looking at £175+ for the complete assembly, so to some people, £20 at a risk was worth it if I could manage it. Now though they're cheap enough to replace the whole lot without the worry.